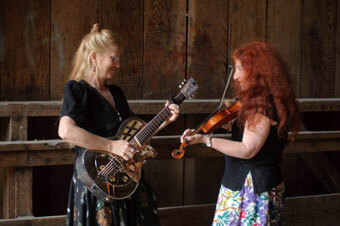 Join fiddle powerhouse Suzy Thompson and guitar goddess Del Rey for an evening of fabulous music celebrating the release of their first duet CD, Hen Party. Covering such timeless subjects as chickens, riding the bus, and discretion (or lack thereof), Suzy and Del explore the upbeat, positive side of the blues in this memorable show. Suzy and Del, who have been playing together as a duet since the mid-1980s, always stir things up with their masterful playing, show-stopping vocals, and humorous repartee. A vital member of the Bay Area acoustic music landscape for 30 years, Suzy's exuberant fiddling and vocals have graced acclaimed roots music bands like the California Cajun Orchestra, the Klezmorim, Blue Flame Stringband, and currently, the Bluegrass Intentions. Del's virtuosic resonator parlor guitar playing embraces a host of old-time genres, including country blues, stride piano, classic jazz, and hillbilly boogie. Tonight, they offer selections from their long history together, with the spotlight on vintage and original numbers from their new Pullet Surprise-winning CD mixed in with flapper-era instrumentals from Kentucky to Trinidad.